Blog Home > Building and Construction > Move Over Velux, New Rooflight Company Coming Through! If, like me, you are guilty of that brand name thing of calling a vacuum cleaner a hoover (note the lower case ‘h’) then you will understand the problem that Jason and his team were up against at Grand Designs Live, at the Excel Centre in London this year, when they brought Roto Roof Windows to the show. Roto make roof windows, and in fact they make great windows, which are easier to fit than the main market leader but everyone knows the market leader, so Velux has become synonymous with the terms rooflight and skylight. 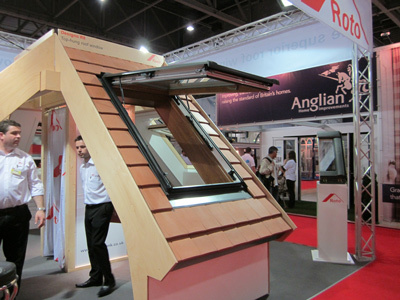 I was impressed with the stand – which was staffed by Roto Sales Technicians, not just salespeople but people who have have hands on experience and knowledge of fitting roof windows. They knew their product inside out and what was more they were enthusiastic about what they were selling in a genuine and non-pushy way. I had the tour of the products on offer, they obviously have aluminium windows but they also have solid timber windows, and they have a new electronically controlled model which will surely be a bonus for anyone who lives in a barn of a place with high ceilings, and who don’t want to balance on a chair with a pole in their hand, to open the window. The windows are also fitted with rain sensors so they will close if it rains. Even without the remote control opening gadget the opening system was easy to use and as it is a top third pivot window rather than cantilevered you really have a better window opening than the one offered by Velux. There is a range of blinds available to customise your window to suit your interior decor too. The fitting is actually simpler than the other manufacturer and the unit comes fitted with a vapour barrier rather than it being an extra item. 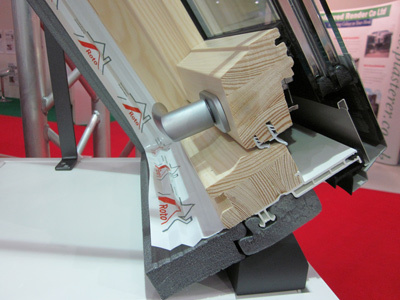 You can also request a factory fitted insulation collar around the window to actually reduce U values. Roto Roof and Windows have a trade training centre at their factory in Rugby, where they are happy to teach fitters and roofers how to fit their products, and to explain the benefits of the system for your customers, and for you as a tradesman. The next training session is on the 25th of June in Malvern, so get intouch with Roto Roof to book your free place. I bet many customers would be impressed with being offered a choice of skylights by their builder, rather than being told, it is this model and this size, no choice of materials and no explanation of the extra vapour barrier and insulation available. I should just say that Roto Roof are not a new company, they are a German company with massive market share in continental Europe, who are aiming to become a household name in the UK. To find out more about their products and services visit their website. 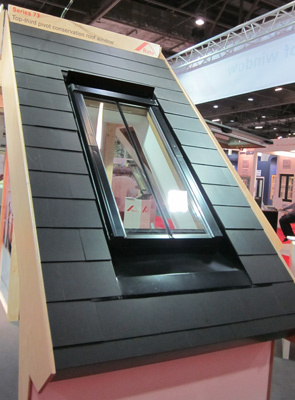 We visited a number of stands at Grand Designs Live to bring you news of new products via our blog including Gowercroft Joinery with their draft-proof sash window system, and LoftZones flooring system, storefloor which allows you to quickly board out your loft, leaving enough space for plenty of insulation! If all this is encouraging you to think about roofing or loft conversions then we have plenty of information in DIY Doctor’s project section to help you on your way.